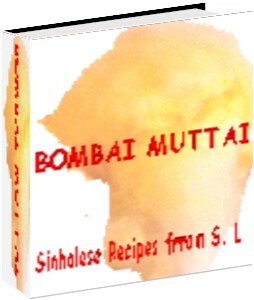 Bombai Muttai is a collection of some (30 to be exact) original Sinhalese recipes from Sri Lanka. These recipes have been published in English and include such delicacies as the title recipe "Bombai Muttai", which is Sri Lankan Fairy Floss. After having tried it, I can assure you that it tastes just like the original used to, from what I can remember. There is also an interesting preparation of an Eggplant Curry and a couple of Beef curries to try. When have you tried a Mango Curry? Here is your chance to give it a go. There is also the delicious "Ambul Thiyal" (sour fish) curry which many people like to bring back after a visit to Sri Lanka. How about a "Yellow Chilli Curry?" Maybe an Ash Plantain Salad? (Ash Plantains are usually available from Asian grocery outlets). So, don't wait, get your copy NOW!